On a crystal clear, bluebird day in Verbier, Switzerland, the women in the ski division of the Freeride World Tour (FWT19) came out of the start gate with a mission: impress the judges more than the woman next to them. With the FWT19 Overall Title still within reach of many of the skiers, each skied fast and fluid on the famed Bec des Rosses face. Hazel Birnbaum gets the 2019 Verbier Xtreme started. American Hazel Birnbaum, who said before the competition that this would be her final start on the Freeride World Tour, dropped in to the entrance couloir quickly, aggressively setting up to take a mandatory air with significant speed. She stomped it, wowing the audience, before taking a few more drops in the middle of the face and straight-lining to the finish. The judges awarded her a 80.00 even, setting a strong mark for the rest of the women to achieve. Switzerland&apos;s Elisabeth Gerritzen sends it in Verbier. Immediately following Birnbaum was Verbier’s own Elisabeth Gerritzen. 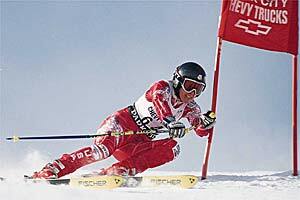 She skied a similar line as Birnbaum, but at nearly twice the speed and with half as many turns. She looked just slightly backseat on her final air, but her confident aggression compensated more than enough. Her score of 85.33 left the door barely open for the other women to beat. The third skier out of the gate had the most to win on the Bec des Rosses today. If Jacqueline Pollard would have won, she would have taken the overall title from Italian Ari Tricomi. She demonstrated complete control throughout the run, and took risks as she traversed to a part of the face none of the other skiers touched for the rest of the day. Despite some technical skiing, her run lacked a large air, and her score of 70.00 reflected that. Arianna Tricomi takes even more air. The final rider of the day, Italian Arianna Tricomi, left the start gate still leading in the overall points total. She only needed to finish her run cleanly to maintain the overall title from last season. Throughout her run, she jumped off every cliff on the course, stomping each before moving on to the next. While she definitely had more air than all of the other women, she lacked the speed and fluidity of Gerritzen. The judges awarded her a score of 81.00, which was enough to finish in second place for the day’s competition and win the Overall Title for FWT19. Utah’s Pollard finished second for the FWT19 Overall Title, missing the top spot by only 220 points. She is SKI&apos;s pick for overall FWT19 Rookie of the Year. With her win on the Bec des Rosses, Gerritzen moved up to third in the Overall Rankings for FWT19.